The first time you walk through the door at Bawarchi Grill & Spirits, you may well think you’ve got the wrong address. The decor yields virtually no clue that this is an Indian restaurant. Instead, everywhere you look are TV screens tuned to soccer matches, tennis tournaments and the NBA playoffs. Suspended from the rafters, college team banners and sponsor-emblazoned hoods of stock cars add to the illusion that you’ve stumbled into a sports bar. In a way you have, though you won’t find any wings or loaded nachos on the menu. 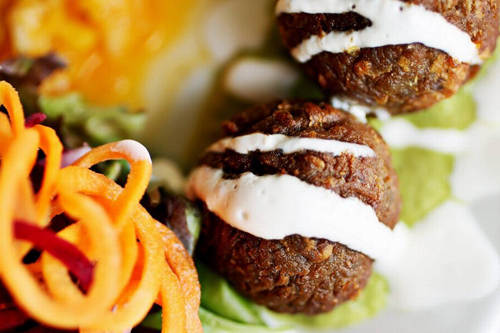 Bawarchi inherited its look from Rookie’s Sports Bar, the previous tenant in the strip mall space where the Indian restaurant opened in January. The decision to retain its predecessor’s decor lock, stock and beer barrel was no doubt a cost-saving measure. With a little imagination, it could also be seen as setting the mood for the concept embodied in the “Grill & Spirits” part of the restaurant’s name. Clearly aimed at broadening the appeal of Indian cuisine, the name promises an unintimidating experience for those less familiar with Indian cuisine. Does Bawarchi deliver on that promise? Well, yes and no. The food certainly holds up its end of the bargain. 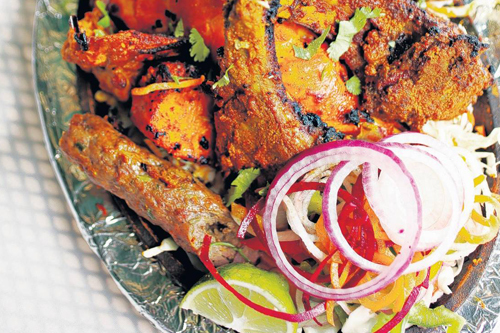 The “Grill” in this case is a tandoor, the Indian clay oven where veteran chef Gunasekar Arumugan turns out grilled and roasted meats and serves them up sizzling on a cast iron platter. Bawarchi’s tandoori offering is exceptionally broad, with a dozen options ranging from pomfret to mint-marinated chicken Hariyali kebab. The mixed grill is a shareable sampler of chicken tikka, tandoori chicken, lamb sausage (seekh kebab), shrimp tikka and a lamb chop. All but the shrimp (overcooked) were on the money when I ordered the mixed grill recently. A handful of items scattered throughout the rest of the menu reinforce the contemporary Westerner-friendly concept. Avocado kofta, for one, turn out to be delicately crisp fritters served with mango salsa and a small mixed green salad. Fish fingers are an iconic British snack better known this side of the pond as fish sticks. Mango lassis come with a raspberry swirl and a smiley face on top. But the bulk of Bawarchi’s extensive offering is a survey of traditional Indian dishes, roaming the subcontinent from the curry leaf-spangled dal of the South to the meal-in-a-bowl biryani of the North. Separate sections are devoted to biryani and Indo-Chinese specialties. You might start your tour in Southern India with chicken 555, that region’s culinary cousin to the more familiar chicken 65. In this variation (pro tip: our server called it “chicken triple-five”), bite-size pieces of boneless breast are deep fried and then simmered in a spice-reddened sauce enriched with coconut and cashew. Then head over to Goa on the West coast for chicken or lamb vindaloo. The vinegar tang that’s a hallmark of the dish is restrained here, but Bawarchi’s version packs an authentically fiery punch (which the kitchen can adjust to your preference). 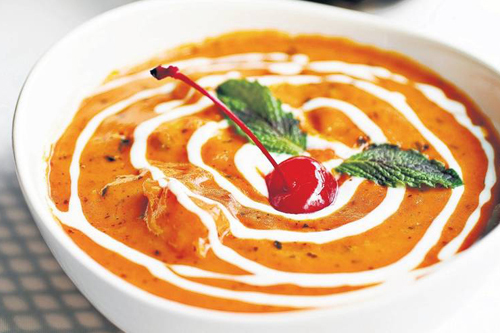 Push on into Northern India for butter chicken, which earns its name — and best-selling status at Bawarchi — with a rich sauce of tomato, butter and cream that will have you ordering more naan for sopping. As long as you’re in the region, it would be a shame to pass up the lean, tender chunks of meat and subtly sweet cashew-thickened sauce of lamb korma. 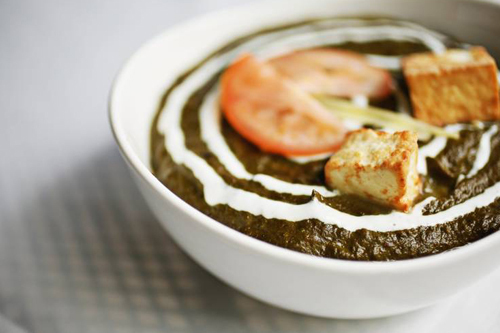 And an order of the classic spinach-and-fresh-cheese dish saag paneer will have you patting yourself on the back at how enjoyable you’ve managed to make a meal following your mom’s “eat your veggies” advice. If you’ve got a sizable party (or don’t mind taking home leftovers), hop over to Kolkata for some Indo-Chinese. Gobi Manchurian, say, or Hakka noodles (chicken or vegetarian) tossed in a fusion sauce of chiles, Indian spices and soy. And by all means round out the feast with a biryani. Chicken (boneless or bone-in) is a crowd-pleaser, goat a more adventurous option (watch out for bones). Bawarchi’s bar still has a way to go to live up to the “Spirits” part of the restaurant’s name. The offering includes a respectable selection of beers, wines and liquors, but cocktail execution is, to put it mildly, a work in progress. A house specialty cocktail I ordered called Manhattan in Style took nearly half an hour to produce (this on a slow night), and finally arrived without the promised cherry garnish. Oddly, that same night, an otherwise classic rendering of shrimp masala was served with a maraschino cherry garnish. I’m still trying to figure that one out. The Apex location is part of a national chain of more than 40 restaurants operating under the Bawarchi umbrella, though the franchises are by no means clones. In Morrisville, Bawarchi Biryanis, a fast-casual eatery in the Spices Hut Indian grocery, has little in common with the Apex restaurant. I’m going to go out on a limb and say that Bawarchi Grill & Spirits in Apex is the only one in the chain with a full-on sports bar motif. The food is the real deal, though, and if you look a little closer, you’ll note that a few of those TV screens are playing Bollywood films. Other: full bar; accommodates children; excellent vegetarian selection; patio; parking in lot.